Dinner (Sunday-Thursday) 4:30 p.m. – 10 p.m.
Friday & Sat 4:30 p.m. – 11 p.m.
We offer both self parking adjacent to the restaurant and complimentary valet parking as you arrive. We offer live music every Tuesday night from 6:30 to 10:30 pm, Saturday night from 8:00 to 11:00 pm, and Sunday Brunch from Noon to 3:00 pm. inlcuding antojitos, street tacos, cocktels de mariscos and main dishes made with fresh seafood, wood grilled meats, local produce and salsas that are all made fresh daily. Celebrate Easter with family and friends over brunch! Enjoy mimosas, brunch cocktails, and the best Huevos Rancheros in town. Live music on Easter Sunday from 12 pm to 3 pm. We had a 7:30 reservation and we waited until 8:30, but still not seated so we left. I love this place and usually the service and food are excellent but this time the service was horrible! Our server didn’t show up for quite sometime. When she finally did show up she got our drink order wrong. We ordered our appetizer right when she first introduced herself and didn’t get it till after the meal arrived and I had to remind her. She never brought our waters. Didn’t refill our drinks. Promised us a free dessert for all our trouble and we didn’t even get that. Food was ok. Both salmon and the duck was overcooked and dry. Reasonable prices though. They sat us outdoors with an amazing view. We made reservations a week ahead of time. Arrived at the restaurant at our reservation time and had to wait 50 minutes to be seated. Not happy about that. I'm sure if I was 50 minutes late, they wouldn't have held my reservations. I'll think twice about eating there again. I made the drive from Diamond Bar to Newport just to visit Sol but this visit I was a bit disappointed with table that was issued to us. I was not at all pleased with sitting next to the kitchen. My guess arrived before I did therefore I did not make a request to be moved. Although, the parking attendant was completely wonderful in helping my guest. Having not tried this restaurant since it opened we tried it and were delighted. The food was exceptional......service good and we got a view table. Only complaint, the view table was right next to the kitchen and the noise was quite loud and the wait staff were constantly coming and going. Would definitely return, but ask for a different table next time. Taco Tuesday is always a fun time at Sol!! We waited over 45 minutes (we had shown up on time for our reservation for a party of 2), and we never got seated, we ended up leaving and going elsewhere. Extremely disappointed. We are searching for a good Mexican restaurant after El Torito Grill is going out of business. 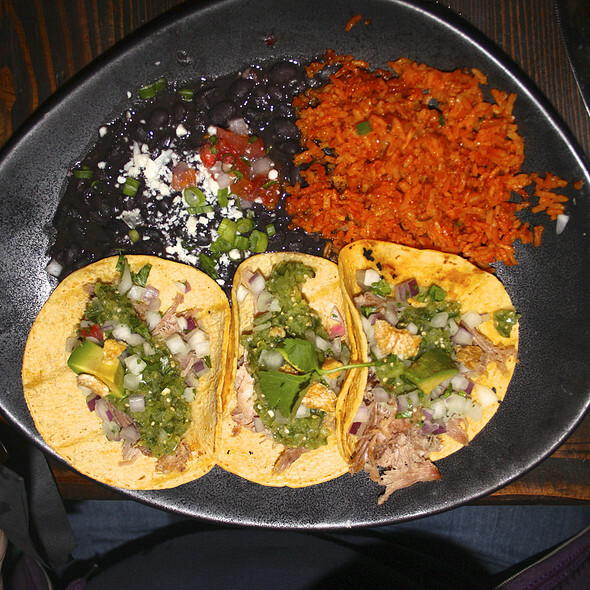 Thought to give it a try at Sol Cocina, and overall the restaurant is okay, the food is good. But I did not feel welcome here, we got a table outside and there was a heater that was roasting me and my daughter 😴, I was so dizzy and hot. The server was nice but she just rushed everything, we got our food and everything in like 30 minutes. We dine in there for less than an hour and it’s not cheap. When we were finally seated, no server came by for 20 minutes. My niece was visiting from GA and I requested a booth by the window so she could enjoy the amazing view of the bay and boats. They seated us at a special table by the window, which my niece really appreciated. Service was phenomenal and food was great. We were not rushed at all as we sat and visited. Really enjoyed our time together! Great specials for taco Tuesday! Service was a little slow this visit and we were seated in a booth with cracked upholstery, which was a little off-putting. Always a great dining experience. The food is excellent, a great variety so everyone in our party is pleased. It is a beautiful facility that sits right on the water! My husband and I celebrated my birthday at Sol and enjoyed the appetizer corn on the cob, a bottle of wine and differnt types of tacos - all were very good! Perfect table looking out onto the pier. We love the margaritas & authentic Mexican food. It’s our go to restaurant to take our visitors. This last time, though, our waiter got a number of things wrong. He was pleasant but I had the wrong side & the wrong size of margarita. It also seemed to take forever for he or anyone else to notice we had been seated. Not what we’re used to. Terrible hostesses! They were really unfriendly and unprofessional. They couldn’t find our reservation at first, although the restaurant sent us the text message that day to confirm the reservation. Then, they gave us the worst table in the restaurant when half of it was empty. The worst thing was their attitude - the energy was negative and we felt unwelcomed. They shouldn’t work in the service industry!!!! We have been to Sol a few times for weekend Brunch so, when our daughter was in town, we decided to go to Newport and have brunch. Made a reservation on OpenTable for 10:00 a.m. when they opened. When we got there, there was a large party before us which overwhelmed the poor girl at the reception podium as they were not ready to seat them. What the dozen employees were doing prior to opening was beyond me. The large party also had a large cake that the receptionist took to the refrigerator leaving us poor paying customers in the lurch. You would think that one of the dozen employees milling about could have done that. Anyway, when it was our turn at the podium, the hostess could not find our reservation even though I received a confirmation from OpenTable which I showed her on my cell phone. She said the reason was that her manager hadn't given her the OpenTable list as of yet. What was the manager waiting for...dinner? We did a nice table with a view of the marina. Our waitress began taking our orders. My wife ordered her meal with a side of potatoes. We didn't feel that our waitress was listening and, sure enough, forgot the potatoes. Anyway, long story short, we are scratching Sol Cucina off of our list. The manager - Samantha Ross - could not have been nicer. Got us a great table and complimentary grilled corn appetizer. Quick dinner with a business friend, Taco Tuesday, great deal. We had a nice table with a ocean view. It is noisy due to the crowd. Valet parking for tips only bring some cash. Overall very nice! Food was mediocre. Surprised that it is such a popular spot. If you don't have a reservation, you can wait for hours. Plenty of much better places in the area. Loud music, hard to carry on a conversation. Will not be back. Dinner was wonderful- only downfall was that the food was not as hot as it should have been (barely luke warm), but it was excellent tasting. Chorizo cheese dip was excellent! The worst service we have received. The hostess/manager was rude. We will never go back. Excellent food but very pricey. Seems they had issues in kitchen. Took 1 1/2 hours get out food and we were there when they opened. Wait staff was very good, brought us free corn on cob due to wait. Also made reservations 1 week in advance and still got table in back of bar. Front window overlooking boats Would have been nicer. Overall had a great lunch and they do have great bloodmarys. Always love eating at Sol. Very nice evening. Great food and drinks. Delightful waiters. Live music. Great Taco Tuesday specials. Friendly service. Would recommend. OMG! The food is delicious! I want to go back and try something else but I liked what I had so much that I want to eat that again. Wide range of choices and pricing. There were 8 of us and only half had drink(s) bill came to about $300. But the unusual treatments for Mexican food was great! My family brought me here for my birthday. RSVP is recommended or you won't get a table. We got there 30 minutes early and we still had to wait about 10-15 minute after our reservation time to be seated. I did request to be put by the window where it's more scenic of the marina, but it was so crowded and packed they placed the 6 of us on the side corner of the restaurant. In a way i was a bit disappointed since 1. it was my birthday and 2. it was reserved weeks prior with that request but I understand places like this is very unpredictable. In a way it was so loud with people dining on a friday evening that maybe sitting in that corner wasn't too bad, but everything was just so slow. The food took forever to come out. Food was delicious, server was quick, but to say you'd feel special celebrating your birthday there...NOPE. There was no acknowledgement or anything like some places, heck even TGIF pride their birthday celebrations for their diners. At the end we didn't get want desserts or Happy birthday or anything. This place was too busy, you can't hear anything besides people talking and laughing. Don't expect to be ale to sit and have a nice long convo while dinner here. It was great brunch with good seating. Food was fresh and complimentary chips were so yummy. Grilled Octopus was amaaaaazing !!! Great as always at Sol! We celebrated my sister’s birthday at Sol and were pleased with the experience once again. The food is always flavorful and fresh. We’ve been there on a few different occasions and have always been pleased with our choices. It’s a great place for any occasion and is always a place we recommend. Best Mexican food within 100 miles! What a wonderful surprise! The location, the views, the service... and then the incredible Mexican food. The menu has some wonderful surprises (great vegetarian items! ), and just wonderfully inventive dishes that take you right to the heart of what must be authentic Mexican. The spicy level was great. We had the ceviche and a melted cheese dish that was phenomenal. Our entrees were excellent too. Our guests were not huge Mexican cuisine fans but they left saying they would make reservations in advance when they fly back to So Ca for their next vacation. The attentive, gracious service was also refreshing in the land of Newport. I’m a native so I’m sorry to be harsh on our brethren but... go to SOL! Fun atmosphere and excellent food! Only bummer was we had a reservation but our table was too small for party of four.